There was a point where I thought simply owning an M car was cool enough. Apparently, that isn’t the case anymore, because BMW keeps pumping out M Plus Some More models that make me feel a simple M car is now inadequate somehow. 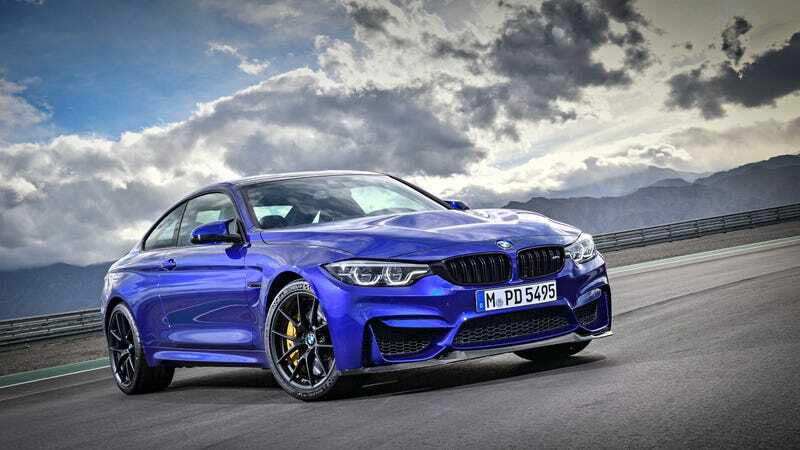 The latest offender is this, the 2018 BMW M4 CS. For the people who missed out on the BMW M4 GTS, or something. Here are the stats: power has been raised (minimally) to 460 horsepower. Zero to 62 mph is achieved in 3.9 seconds. Top speed is electronically limited to 174 mph. The DCT gearbox comes standard and a manual cannot be had here. Sorry. Light-alloy wheels, designed especially for the M4 CS, also come standard with Michelin Pilot Sport Cup 2 tires. The interior is supposedly still nice because “no M4 CS driver will need to compromise on the nicer things in life.” I should hope not! Everything on the outside has been aggro’d up to reflect the super-duper-sporty nature of this revolutionary and ground-breaking M4 special edition. Carbon fiber sharp angles everywhere! Don’t cut yourself on all that edge! The car costs €116,900; official U.S. pricing has not been announced, but that’s approximately $125,000. Yeah, go, buy it. Be different. And dare people to say the words, “But M4 GTS,” around you. Here, enjoy some more high-contrast photos of it.